Went Golfing - - - 4 messages. Showing 1 through 4. Got out yesterday with BigFishin after class for two hours before he had to go to work. Started off in one area, punched 9 holes moved to the backside of the hole and punched 9 more. Clay started off with a Bad Dog Spoon in Pink and Gold, and I went with a Green and Gold Bad Dog Spoon, that was coupled with a Pflueger President, two pound fluoro ice and a 28 inch Ultra light Midwest Rod and Reel. These spoons have been working very well for us picking up the aggressive fish out of the school everytime we hit the ice. After a little while I switched over to a 1/8 oz Scenic Tackle Glo-Devil in red, which picked up a lot more sunfish. Weather was great, we couldnt have asked for any better weather. We only had to play the front nine, our first hole we each hit, we popped two nice crappies, the game was on from there. Clay brought the wood for his big fish. I have to say, my mid range clubs and green work really stuck it to him though, it was a pretty sound game! 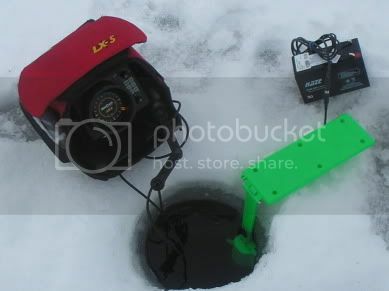 I also got to use a new product made by Symtec, called the Holie Molie, sounds funny and I had to admit I was real skeptical about it, but what this product does is blow water in your ice hole, preventing it from freezing, you can run this off your marcum battery, a regular 12 volt, or off 4 D batteries, it really did a good job, I was impressed with it. Another feature of it is you can adjust it to the bottom of the hole and it will after an hour or so make the bottom of the hole a funnel, making it easier to slide big fish up the hole and prevents having your hook hang up on the bottom of the hole and lose the fish. Check them out, they retail for about 25 bucks. Kind of a neat little gizmo. Fixed your images for you Chris. Lookin' good! Sounds like you had a blast Chris..